There has been a lot of bragging about who makes the best, most accurate jets. Some claim brass jets are eroded by flowing gasoline and nitrous, thus making them inaccurate. While it is true that the flow of gasoline and nitrous will eventually wear away the brass surface, that process would take about 1 million years, not a concern for most of us. The NX HP Jets are manufactured on CNC equipment, and are guaranteed to be within .0005 of specified jet size. In recent testing, using the same jet size, HP jets out flowed the competition by 35%! That’s right 35% more flow through the same orifice, how you ask? The NX HP Jets were designed to be more than just a hole in a piece of brass; its contoured inlet and multi-stepped outlet allows turbulence free flow with no restrictions. Tired of chasing your nitrous jets around? Never can find the one you need when you need it? The NX Jet Box is a convenient, safe way to store your Nitrous Express jets. 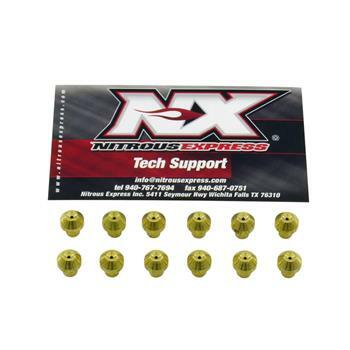 Protecting them from damage and with enough capacity to store a nozzle systems complete jet inventory, this is a must for the serious nitrous user. A custom, anodized, aluminum, billet, jet-changing wrench is included.